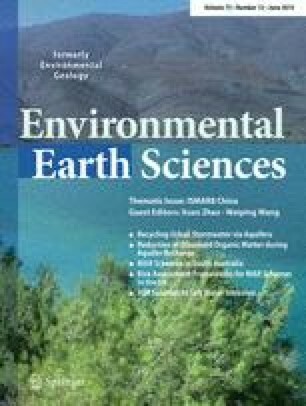 Recent evidence has shown that CO2 emissions from reclaimed mine soil with acid mine drainage and carbonate material is an emerging geohazard. Surface CO2 flux measurements can be a cheap and effective way to delineate such hazards and avoid residential and commercial real-estate development on high-risk zones. Very little work has been done to ascertain whether or not such fluxes are spatially correlated, which has significant implications on the choice of statistical methods for analysis. The objective of this study was to understand the extent to which CO2 fluxes on a reclaimed mine spoil, with CO2 from carbonate neutralization of acidic drainage, are spatially autocorrelated. CO2 fluxes from three reclaimed surface coal mine sites were measured and used in statistical analysis to test the research hypothesis. The results show that the spatial variability of fluxes is not always random but can show significant (p < 0.0001) spatial autocorrelation. This result implies that classical statistical analysis of CO2 fluxes from reclaimed mine land may lead to wrong inferences, since such analysis ignores the spatial correlation. It appears spatial autocorrelation in CO2 fluxes may be related to spatial autocorrelation in soil temperatures, suggesting a common underlying phenomenon. Significant contribution of CO2 from exothermic acid mine drainage to soil CO2 flux is suggested as a possible explanation. The authors would like to acknowledge: OSMRE’s Applied Science program’s project #S09AC15437 and the Government of Botswana for financial support, Dr. Bret A. Robinson for his assistance in accessing the Hudson site and sharing ideas, Alfred J. Baldassare for his input and assistance in providing access to the Godin site, Mr. Bismark Osei for his assistance in this work. The authors are also grateful for the reviewers’ comments, which greatly improved the discussion and, hence, the scientific merit of the work.